I’m on Urban Spoon’s e-mail list, which has to do with food and cooking, as the name suggests. I was shocked by an animation in today’s e-mail from newsletter@urbanspoon.com which shows an elegantly dressed young woman puffing away on a cigarette, adjoining another panel full of beautiful peonies. This might have been considered acceptable several decades ago when cigarette smoking was being promoted by tobacco companies and others as a desirable behavior, especially for emancipated women. But in this day and age? I can’t think of anything more deplorable. Then I followed the link and discovered it was a character from Mad Men, supposedly “looking pissed,” as the caption maintains. So do I chalk my overreaction down to simply failing to be hip with modern TV culture, like Mad Men? Or is this something to get upset about? In seeing the reply from the staunch smoking advocate, Michael McFadden, regarding the Johnny Carson clip, I did some checking on the people featured in the clip. Note that George Gobel, Dean Martin, Johnny Carson were each prominently smoking … but Bob Hope was not smoking. George Gobel died at age 71 during heart surgery. Dean Martin was diagnosed with lung cancer, died age 78 of respiratory failure due to emphysema. Johnny Carson had a heart attack, died age 79 of respiratory failure due to emphysema. Bob Hope died at age 100 of pneumonia. One Internet source said Hope did smoke, another said he did not. Because he did endorse Chesterfield cigarettes back in the 40’s, I’m speculating he may have smoked back then and later quit. I don’t ever recall seeing Hope smoking. Hardly seems the warm nostalgia McFadden tried to evoke. 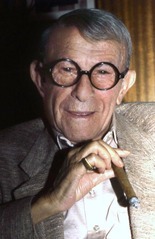 Gee, you’re right about George Burns. Also, our old nemesis in the (Missouri State) Capitol, John Britton, is in his late 80’s and about a year ago commented on how he cut back from smoking 4 packs a day to only 3 packs a day now. By the way, I heard recently he now pulls an oxygen tank behind him. 1 – For every 1 smoker that lives a very long life, there are many others that have their lives end prematurely. On average, smokers live about 13-14 years less than non-smokers. 2 – Don’t cigar smokers say they don’t inhale? That could reduce the odds for respiratory and cardiovascular diseases, but not for oral cancer. The real reason they likely don’t inhale may have to do with the alkalinity of cigar smoke making it difficult to draw into the lungs. With cigarettes, the tobacco is flue-cured to concentrate the sugars, plus other sugars like molasses are added, to reduce the alkalinity and make the smoke much easier to inhale … and much easier for the toxins to be introduced to the respiratory and cardiovascular system. I’m running into this in my Torah study. Much of the behavior is pretty despicable. The challenge is to see it in context. And it is a personal challenge to not be the judge. Art depicts both what we do, and what we should do. MoGasp, you’re upset that “One of the Worst Moms Ever To Grace TV” is shown smoking? On my part, I am FAR more upset that in recent Dexter seasons the only smokers were a sleazy motel owner with a raspy voice and a gang of homeless pedophiles. Or that Hannibal displays all sorts of impalements/disembowelments followed by recipes and feasting on human flesh while not a single character is ever allowed to be shown smoking. Does Hannibal *really* need to be “sanitized” thusly for the children? Now sit and watch current similar shows for the next decade: You won’t see as much smoking as in that single 15-minute clip. Are you going to seriously claim that Gobel, Carson, and Martin all smoked that much on the show because they were told to do so by Big Tobacco? My concern would be FAR more with the forces or cultural powers that have turned our televisions from a reflection of reality into a covert social-engineering tool. mogasp response: You make some legitimate points. I found the juxtaposition of images in what I thought was an e-mail to do purely with food and eating jarring and disturbing. Actually, in addition to Dex and Hanny, I began watching the whole “Bones” series a few weeks ago via Netflix. Aside from one strange scene with Seeley in a bubblebath with a beer hat, a comic book, and a cigar, I think the only smoking in 4 years of burned, eaten, mutilated, disemboweled, decomposing, maggot-crawling, child-friendly corpses was one where someone TRIED lighting up on the way into an outhouse. Once inside you heard him once again striking a match, which of course then blew the outhouse up and sent the nasty smoker flying 20 feet away in a ball of flame. You may remember from Brains that I did a TIVO analysis to test the antismoking claims that MTV was “filled with smoking!” TIVO let me speed through 24 hours of music vids and I believe I found a total of 3 minutes of smoking out of the 1440 minutes of broadcasting. Heh, and most of those 3 minutes were from several replays of a Sinatra video and some sort of commercial featuring a pipe-smoking caterpillar. OH! And there were also TEN minutes of body-bag antismoking commercials. I don’t quite see how I was trying to “evoke nostalgia” with that clip tho. The point of citing it was to show how the media has cooperated in the social engineering program that dictates that even on shows like Hannibal and Dexter, shows full of bloody, anti-social, and most definitely NOT-for-children storylines, the horrendous act of smoking is pretty much totally forbidden. The extent of the fixation that brings about such air-brushing of reality was recognized when it was present in bug-a-bears like Hitler and Stalin, but we seem to be totally oblivious to it when it’s used in support of the nice pretty things we like. In terms of objectivity, Brains has been out for ten years now, and I think you’ll find that there’s been very, very little in the way of any objective criticism of its content. Nor of the content of my more recent TobakkoNacht. Bob hope quit smoking in his mid-30s. I read that in a 1979 People interview. He also quit alcohol and caffeine.